The Contempo Sculptured Scarf Collection is my newest Collection of scarves and accessories. The Contempo Sculptured Scarf by Valerie Baber Designs in soft Hand Painted merino wool adds a contemporary accent to your wardrobe. The Contempo Collection is a group of accessories new for 2014 that give a more contemporary flair to your wardrobe. This collection will have various styles that can be worn and purchased separately or work together to become a dramatic and sculptural piece. Other colours are available. I wanted to add a more sculptural scarf that could be literally sculpted to your personality and design style. A double take on sculptured. I will be offering the pieces separately as well so you can choose which piece or pieces you would like to make into your own unique style. The Contempo Sculptured Scarf is a combination of two scarves together. This one is done in 3 different colour ways of Grey Mauve, Deeper Plum, and a Purple, Green hand painted colour way. These yarns are lusciously soft and warm. The Contempo Mode Scarf, base of the Contempo Sculptured Scarf, is accented with 6 metal buttons so you can button in the style you like or use them to button the sculptured scarf onto the base to secure it. 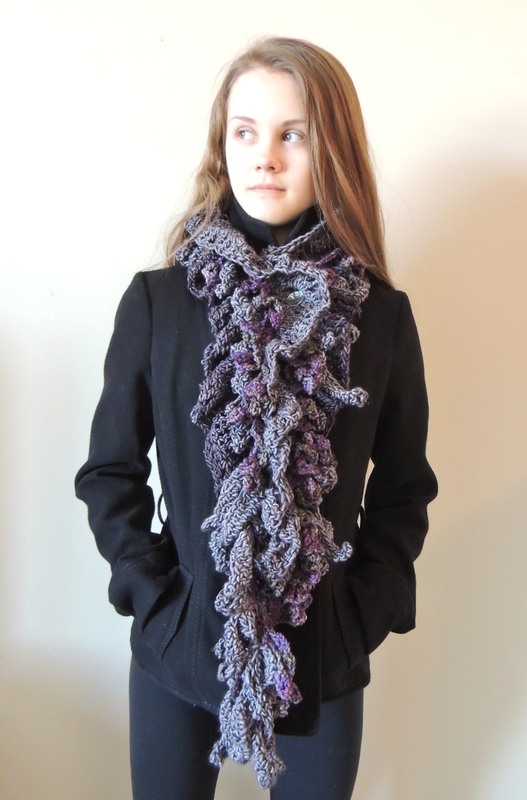 You can be very creative with this design wearing each scarf together or separately. The lighter sculptured scarf is great for the warmer days or as an accent piece. The ruffle scarf can be worn separately for the slightly cooler day with a different look. Together these scarves become a wearable art piece perfect for the cold days of winter. The Contempo Lace Scarf is the sculptured accent scarf is done in 2 different colour ways of Grey Mauve and a purple to green hand painted merino wool. These yarns are lusciously soft and warm. Available in other colours. The Contempo Lace scarf is very versatile in design and can be worn in many different styles. Combine it with the Contempo Mode scarf to form the Contempo Sculptured scarf. The Contempo Ruffle Scarf, teal scarf, is the same as the Contempo Mode Scarf without the buttons. The colour and texture blend together to add that unique quality to the design. The Sculptured essence and ruffles of this design has a Contemporary and Modern feel with a classy touch. The Contempo Collection includes many different styles with more being added throughout the year. I will be designing hand warmers and smaller pieces with a lighter price point for this collection as well. I hope you enjoy your day and become inspired by your surroundings.